Yemi Adelani netted a brace as The Foxes edged out The Robins at Cricklefield to go 11th in the division. Adelani put the hosts ahead after just eight minutes, only to see Joe Wright head home a leveller three minutes later, but in the 25th minute Lamar Douglas saw an effort just cross the line, according to the linesman, despite an acrobatic attempt to clear it off the line to give Ilford the lead once again. Sawbo fought back again to level on the hour mark thanks to Ollie Fortune, but Adelani then netted a solo goal four minutes later to restore Ilford’s lead once again. The visitors had the chance to level for a third time seven minutes from the end but Rossetti saved their spot-kick, and it meant the hosts claimed all three points. Sawbridgeworth drop to 13th after this defeat. Rovers put in a magical second half performance to see off a struggling Manor side at Southchurch Park. The hosts were unlucky to not be ahead at the break but saw the visitors go in front through Jay Nash just past the hour mark, and it was two with twenty minutes remaining when Scott Kemp pounced on a rebound to double Rovers lead, and then the visitors sealed the points with eight minutes left when Fion O’Reilly netted a great strike and sees them into tenth spot. Manor slip a place to third bottom and are only six points above Barkingside albeit with a game in hand. Wale Odedoyin grabbed a brace for Hamlets as they stunned their Mile End rivals Sporting Bengal United by claiming all three points to lift themselves further away from the bottom two. In an incredible first forty-five minutes the visitors put their rivals to the sword, going into the break three goals to the good thanks to Odedoyin’s double and also a further strike from the penalty spot from Luke With. Charles Gregory did pull a goal back from the spot just after the break but Flavio Jumo netted a fourth for Hamlets to seal the victory, this despite Kamarl Duncan’s late second for the hosts. It means Hamlets are now three points above Manor and nine ahead of Barkingside albeit Manor have a game in hand, whilst Sporting remain seventh. Lanre Balogan, Luke Marshall and Connor Scully all netted for hosts St Margaretsbury as they got back to winning ways with victory over bottom side Leyton Athletic at The Recreation Ground. Balogun put the hosts in front before the visitors levelled through Okwute Izuchukwu, however the hosts restored their lead through Marshall before sealing the points thanks to a third from Scully, seeing the hosts remain in eighth whilst Athletic remain a point behind Barkingside at the foot of the table with a game in hand. Jimmy Cox netted on debut to give Enfield a brilliant win against Takeley at Station Road to pull a nine-point gap to the bottom three with games in hand too. 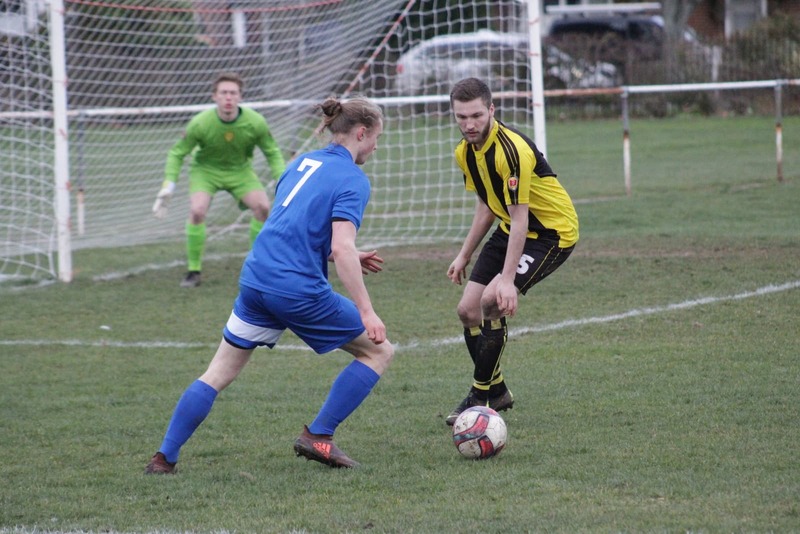 The only goal of the game came four minutes into the second period when Cox, who left Hullbridge Sports this week, ran onto a flick-on from Cook to blast home and give Enfield the win. Defeat for Takeley sees them remain fourth and still six points behind Stansted with a game in hand. Marcus Bowers netted late on to give ten-man Stow a huge win over league leaders Stansted to bring the hosts back into the title race which was blown wide open after today. Things didn’t look good for the home side though early on after Leon McKenzie was shown a red card for dissent, but despite this the game remained tight, and in the 83rd minute Stow netted what proved to be the winner when a free-kick into the box saw Bowers turn past Turner, lifting them into fifth spot now, fourteen points off the leaders now with three games in hand. For Stansted, who saw Sam West sent-off late on for fouling Dwade James, it was a disappointing day at the office and they remain top by four points, but Hullbridge below them have two games in hand.